Andrew Horn couldn’t remember the last time he released his anger. The 32-year-old founder of Tribute.co, a video montage platform recently dubbed by the New Yorker as “Hallmark 2.0,” recalled throwing things and slamming doors – but never actually expressing his anger. So, one of the attendees in his men’s-only meeting group handed him a pillow while the others encouraged him to scream into it. He let out a guttural release of primal rage. “I felt a lot better,” he explained. Horn says the key to unlocking his emotions has been discovering “modern masculinity,” a movement of men exploring their emotions in small group settings. Instead of fighting it out “Fight Club”-style, men are sitting in small group circles weekly in office spaces and during outdoor retreats to talk through their feelings, allowing themselves to grow more vulnerable, and, yes, to cry together. By getting in touch with themselves, they believe they can be better employees, leaders, partners and parents – and avoid the toxic behavior that has allow previous generations to treat women as second-class citizens. There’s a renewed emphasis among some men, particularly those that lead media and technology businesses or reach large audiences through their work, to communicate with more emotional intelligence, said Horn, who founded the modern masculinity group Junto this year as a response to MeToo. The examples of what not to do are plentiful, but there’s not a clear mainstream answer for what men should become, he said. Men are taught to suppress their emotions, Horn explained. Left to simmer, it leads to an explosion of self-destructive behavior and violence against women. They’re taught to find solutions, but not how to understand others or release their feelings in a safe manner. Horn become familiar with modern masculinity from Evryman, an organization started by Dan Doty, Lucas Krump, Sascha Lewis and Owen Marcus. Lewis is best known for founding Flavorpill Media, while Krump is currently vice president at FreeWheel, Comcast’s ad tech platform for over-the-top streaming services. Both Doty and Marcus had done previous work with men’s groups. 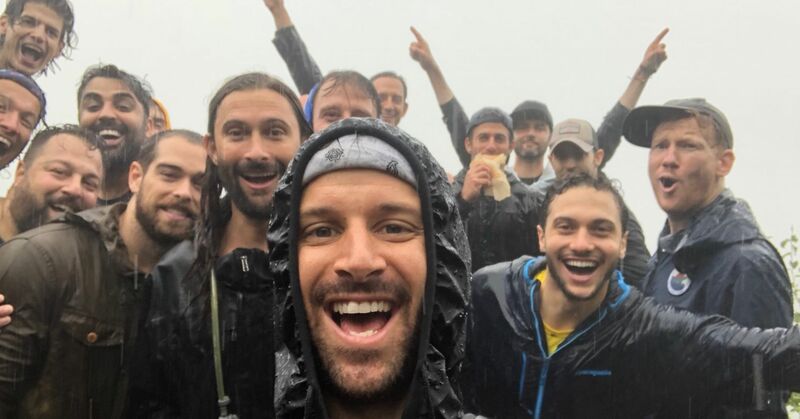 When Evryman started in early 2017 — the first meeting was in a New York office during the weekend of the Women’s March in January 2017 — there were only a couple of men’s masculinity meetups on the Splash event marketing software platform. Today, there are almost 100. Men come from all walks of life, ranging from media and tech executives to former lumberjacks. There are chapters around North America, from Alaska to Maine, with larger followings in cities like Toronto, San Francisco, New York and Los Angeles. In his previous life, Doty was an executive producer at Zero Point Zero productions, focusing on the Netflix reality hunting show “MeatEater.” He’s led young men on wilderness therapy trips, expanding on his earlier work of being a high school teacher in the Bronx. He lives in San Diego now, but he grew up in North Dakota. And he wants every guy to know it’s okay to get angry, to bawl with your peers, and to process your feelings alongside others. Men are conditioned to suppress emotions and treat women objectively from childhood, said Christia Brown, a professor of developmental psychology at the University of Kentucky. Boys are teased when they cry and gain popularity among peers if they have multiple girlfriends, she said. That’s one of the goals of the modern masculinity. In December 2016, Doty held a retreat in the Berkshires called Open Source in order to create an approachable version to other men’s groups out there. Krump — who was previously director of programmatic sales at BrightRoll, which was acquired by Yahoo — decided to attend with around two dozen other men. “I had gone through the successful acquisition and exit from a startup,” Krump said. Since the beginning of 2016, Krump had begun on a journey to re-evaluate his life. After talking to his therapist, he realized he was trying to numb himself from his emotions, including dealing with past issues like growing up with a bipolar father and abuse. He stopped drinking and “chilled out” on drugs. He started searching for communities for support. But he didn’t fit in. There were the “super spiritual woo-woo” groups, which he described as “code word for ‘you walk around with guys in white robes and smudge sticks. '” There were the antiquated men’s movements from the ’90s, which rallied around the concept that men were warriors. There were business-focused groups where it would be awkward to talk about personal issues. 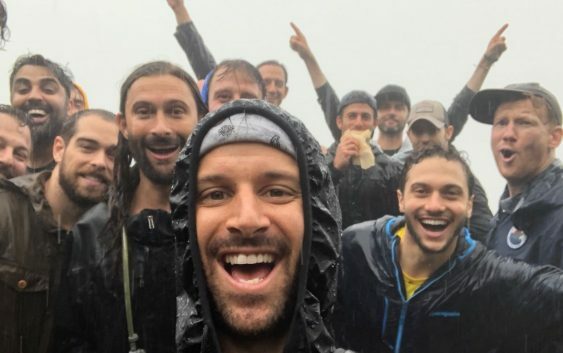 He bounced around 12-step programs for two months, then realized he could never appreciate the camaraderie of these meetings because he wasn’t an addict. When Lewis told Krump about Open Source, he decided to give it a try. Krump was more enthusiastic than most. Many men who have gone to a modern masculinity meeting admit they were frightened, and don’t know what to expect. A promotional video for Evryman has one guy admitting he thought “this is going to be f—— awful.” Yet, something still compels them to go. The Berkshire retreat and other modern masculinity retreats operate in expanded versions of the weekly meetings. There’s usually an outdoor activity. Organizers strive to make the food excellent, and the workouts intense. A recent backcountry Evryman adventure included a 50-mile hike into Yellowstone to look at the stars. At the Junto retreats, 15 men stay in the same house and sleep on angled beds in communal rooms. Next comes the real work. At Evryman retreats, just like in the weekly meetings, the men sit in a circle and start with a thematic meditation where they get connected to what they feel, Doty explained. Then, there is a check-in round where people share the main emotion they are feeling that week. The second round starts with a prompt, like a question about romantic relationships, their relationship with their fathers, or a request to discuss something they’re ashamed of. “It’s like Crossfit for your insides,” Krump said. People have about 10 minutes or so to hold the floor, while others give feedback. Men will get angry. They’ll scream and get upset. Krump cried during a group a couple weeks ago. After the Berkshire retreat, Krump decided to use his experience building companies and dedicate it to growing Evryman. Yahoo, his employer at the time, was about to be acquired by Verizon, and he knew he was going to be let go in a few months. So, he decided to dedicate his severance — one year worth of salary — to expanding the Evryman movement. He dove into the project while the deal was closing. In April 2017, Doty appeared on the “The Joe Rogan Experience” podcast (of recent Elon Musk pot smoking fame) to talk about the modern masculinity movement. Evryman hired a NYU student it found on Craiglsist to quickly build a website, and Krump edited the text until Doty went on air. Within the next 24 hours, Evryman received 3,000 emails. Junto meetings are similar to Evryman’s, starting off with men gazing into each other’s eyes and a brief meditation as people contemplate concepts like body image, sexuality, relationships and other inner dialogues. Junto’s Horn, who also attends Evryman meetings, said he got his inspiration from Burning Man. Horn also acknowledges that diversity among Junto’s attendees will come with time. There are risks to men working out problems and emotions without women present, said University of Kentucky’s Brown. “I worry that it’s a space to bemoan the difficulties to being men in America,” she said. Horn, too, acknowledges that women can easily view the group meetings as threatening or even displacing to their roles in the workplace or relationships. One woman, Horn recalls, said to him that she felt her husband was using the men’s meetings for his “intimacy fix” and no longer needed her in that role. Men must transfer their emotional breakthroughs to the women in their life — a skill that Horn has addressed in meetings, he said. Bence Nanay, a professor at the University of Antwerp’s Centre for Philosophical Psychology, said a better use of men’s time might actually be to discuss the same topics in the men’s meetings with women from outside the workplace, such as sisters, aunts and female friends. Still, the most important part of retraining men to better understanding and communicating their own emotions is to give them the time to work on it, said Brown. If men’s groups are safe spaces, “I do think there’s value in that,” she said. When Doty’s father Blayne heard about the Evryman movement, he thought it was a great concept – for everybody else. Blayne found himself at an Evryman retreat in Race Brook, Massachusetts, this past spring. He was “scared out of his mind” as he sat in a room with about 50 other guys, ranging in age from about 25 to 40 years-old. Before the retreat, Doty said he grew up “in a loving family that had no ability to express themselves.” He remembers coming home from school with tension still in the air. Blayne admits his relationship with his sons was similar to his relationship with his military father – “not good.” He would control situations to protect himself, and was on the path to never really knowing his children. Blayne Doty and his grandson Duke wearing matching outfits at the San Diego Zoo. Before Evryman, Doty wouldn’t wear anything with color. It all changed after that weekend. He now has a relationship with his sons. He walks and talks different. He even dresses different, moving away from tan, black or grey to peaches, pinks, lavenders and Nantucket reds. “I go colors because it’s me,” he said. Right now, we’re just treating byproducts of forcing men to suppress their feelings, Blayne said. “It destroys the man, and it destroys society,” he explained. It’s time to take action – and all it might take is another man to be there to listen. “My hope is that we stop ‘reacting’ for once and make a real investment in all of us,” Blayne said. Note: CNBC and Freewheel share a parent company, Comcast.